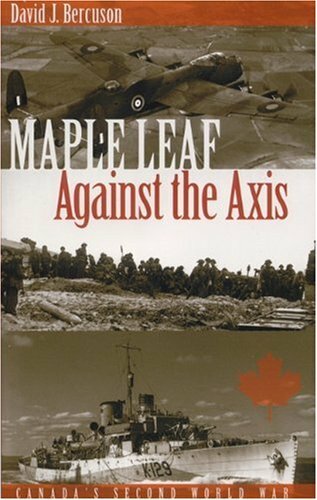 Maple Leaf Against the Axis is a compelling recounting of the Second World War and the Canadians who fought it. Here, in all its passion and drama, is the story of how the Canadian army, navy and air force fought in battles ranging from Hong Kong to the Rhine River crossing. David Bercuson, one of Canada’s preeminent military historians, covers the war on the ground, the naval war in the North Atlantic and elsewhere, and the air war-both the bomber offensive and the story of those Canadians who flew everything from Canso reconnaissance aircraft in the Indian Ocean to Typhoon fighter bombers with the Second Tactical Air Force in Europe. And he does it through recounting the stories of the men and women who were there and played a significant role in the Allied victory. Infantrymen of The 48th Highlanders of Canada advancing towards the Gothic Line near the Foglio River, Italy, 1944.